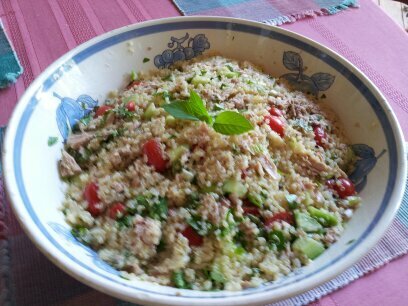 This is a recipe I adapted from Sur la table’s Tuna Tabbouleh with Tomato and Basil. I used quinoa instead of bulgur, left out the shredded carrot and used tuna packed in water instead of tuna packed in olive oil. Having tested their recipe at work**, I can vouch that both are delicious and very easy to make. I doubled the recipe in the photo above. It keeps nicely in the fridge and travels well for lunch or as a dish to bring to a pot-luck. Enjoy! And as always, let me know if you make it and if you liked it.